Remove and disassemble. Visually inspect bolt assembly (1) for cracks, especially in the area of the cam pin hole (2). 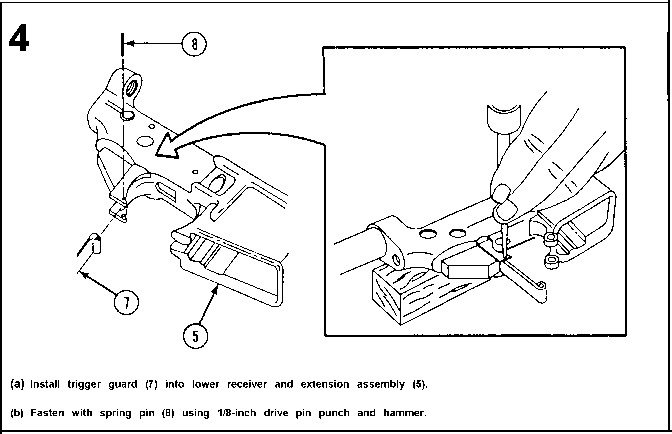 Check for cracks on locking lugs (3), for a cluster of pits or chipped bolt face (4), and for an elongated firing pin hole (5). Check for missing or broken retaining pin (6)/bolt cam pin (7), or cracks on bolt cam pin. Check for worn bolt rings (8). Insert the bolt assembly (1) into the bolt carrier (9). Turn bolt carrier assembly (9) so the bolt assembly (1 ) points down. The bolt must not drop out. Check extractor and spring (10) and ejector and spring (1 1) for dirt and serviceability.